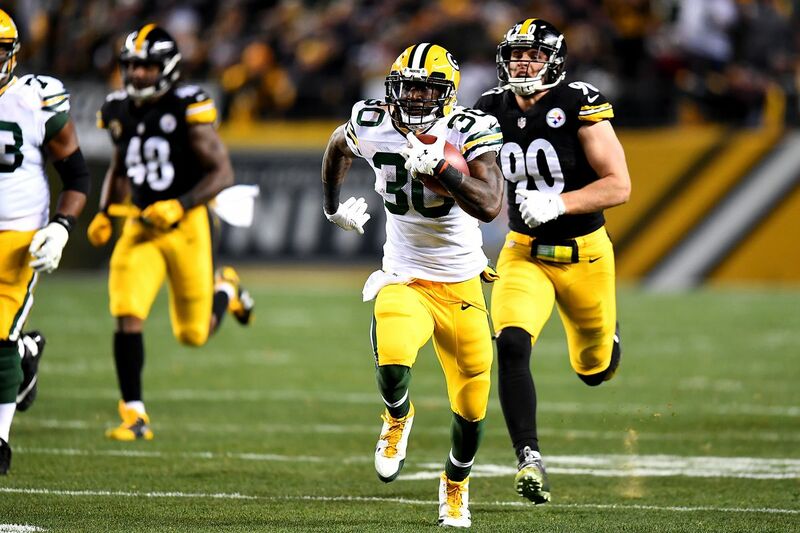 Jamaal Williams is professional NFL player who plays the running back position for the Green Bay Packers. Before being drafted by Green Bay Packers in the fourth round of the 2017 NFL Draft, he played college football for Brigham Young University (BYU). Jamaal’s full name is Jamaal Malik Williams. He was born in Rialto California on the 3rd day of April 1995, to Nicolle and, Larry Williams. His father’s occupation is not known but his mother was a school teacher, but now works with the law enforcement of the Riverside County Sheriff’s Department as a sheriff. She studied economics at UCLA. Jamaal has a younger sister named Jaela who ran hurdles on the University of Nevada, Las Vegas track team. He attended Summit High School, Fontana, California and then the Brigham Young University where he played college football from 2012 to 2016. In college, Malik made his collegiate debut in a game against the Washington State where he recorded a 15 rushing yard. In the next game against Utah, he recorded his first collegiate rushing touchdown, then two rushing touchdowns and 155 rushing yards in the September 28 game against Hawaii. He ended that season, with a total of 775 rushing yards, 27 receptions, one receiving touchdown, 12 rushing touchdowns and 315 receiving yards. The next season for him ended with 7 rushing touchdowns, 18 receptions, 125 receiving yards and 1,233 rushing yards. He began the 2014 season with the game against Texas, where he recorded 89 rushing yards and 12 receiving yards. Unfortunately, Jamaal Williams had a knee injury during an October game against Utah State that kept him on the bench for the rest of the season. That notwithstanding, he ended the season with 8 receptions, 4 rushing touchdowns, 518 rushing yards and 47 receiving yards. Jamaal didn’t play in the 2015 season, following his initial withdrawal from the school. He redshirted and returned in 2016 for his final season. His first game in the 2016 season was against Arizona and he made 162 rushing yards. Jamaal was named the MVP of the 2016 Poinsettia Bowl that season after making 210 rushing yards and a touchdown in the game against Wyoming. He ended his college career with 3,901 yards with 726 carries and 35 touchdowns. He was drafted by Green Bay Packers in the fourth round of the 2017 NFL Draft, as the 134th overall pick and the 13th running back to be selected in that year’s draft. The contract was finalized in June 2017. 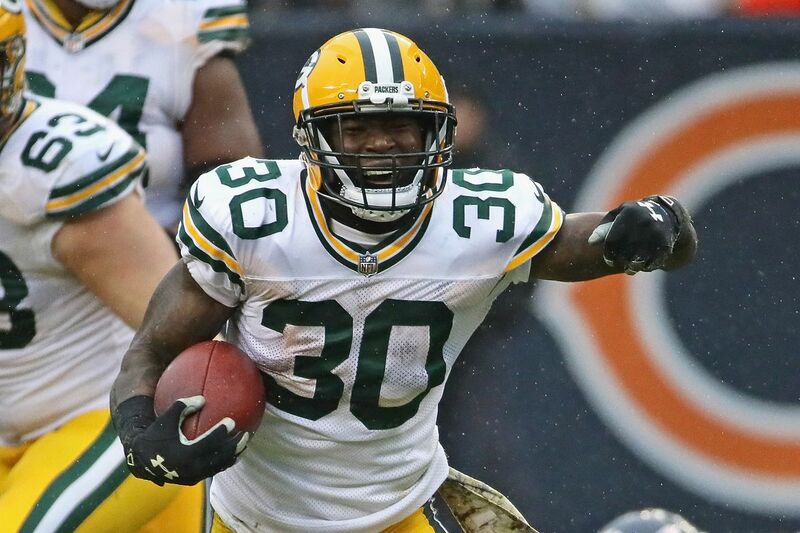 Jamaal Williams began his preseason on a good note with an 8-yard touchdown. His rookie debut was in a game against the Seattle Seahawks where he had two rushes for nine yards. He would later score his first career rushing touchdown in a week nine game against the Detroit Lions. In a December game against Tampa Bay Buccaneers, Jamaal made a rushing touchdown and 113 rushing yards. Jamaal Williams was not meant to make a big impact on the Packers offence in his rookie season but Aaron Jones and Ty Montgomery’s injuries turned out to be blessings in disguise for him as he took over as the No 1 back guy during the second half of the year and became one of the more consistent players on the team. He finished the season with a total of 556 rushing yards, 4 rushing touchdowns, 2 receiving touchdowns, 262 receiving yards and 25 receptions and was named the team’s Rookie of the Year. The Packers’ star stands at a height of 6 ft 0 in, that is 1.83 m and weighs 96kg (212 lb). his body stats are not known, however, Williams has a strong and well-built body which gives him a shot to make the back-end of the running back depth excellently. Williams’ mother Nicolle, is a die-hard fan of her son. The former UCLA track athlete has earned some fans to herself alongside her son as she has always been caught on camera giving her full support to her son right from his days at BYU. Jamaal is committed to giving back to the community and has done so in many different ways. Together with his best friend, they did a football camp for 200 kids at his high school in 2018. He is planning to establish a foundation that will be aimed towards rendering help to children born with different types of birth defects.